You may know that I trained as a clothing patternmaker, back in 1990-91. I was fortunate to find something I loved doing early on – I enjoyed maths, geometry, problem solving, drawing and making clothes, and patternmaking was the perfect combination. I still really love it. However, I began my career as a junior cutter in a Cut-Make-Trim (CMT) factory. I worked in various factories, workrooms and studios over the next twenty years, all in Adelaide but for a short time in London. For nine of these years I worked primarily as a cutter/marker maker (ie creating cutting layouts) which I think made me a better patternmaker. Towards the end of this time, two things happened which helped me write The Dressmakers Companion. The first was that I bought a knitting magazine, Interweave Knits. I looked at the patterns and thought: I can knit and I know how to make patterns, I could do this. I started writing knitting patterns for Australian Creative Knitting, then after a year I went to Yarn (Australia’s best magazine for knitting and more), who later let me write articles. Overall I did about 28 projects and wrote about 27 articles, in the space of 11 years. You can read more of this story here. The practise of writing step-by-step instructions without sounding like an insufferable know-it-all helped me later for The Dressmakers Companion. The other instrumental thing was getting a job as a sewing teacher for a few classes a week. I’d never taught before but I knew lots about sewing, so they took a chance on me. I found teaching sewing to be a huge learning curve and very difficult to start with. However, everyone in the class was wonderful and fun to be around, and they were adventurous with their sewing and not afraid to try new methods or gadgets (especially gadgets). I had been around trained, skilled workers for so long I found their enthusiasm refreshing. Some students were absolute beginners and others were there for the social atmosphere. I enjoyed writing little illustrated handouts for my students. Often, students would ask me if I could recommend a comprehensive sewing book, and the best I could suggest was The Readers Digest Complete Guide to Sewing, 1977 version (a great book, by the way). I should just add that this was 2006; there were websites and blogs, but only a fraction of what’s on the Internet now. No Pinterest, Instagram, apps or Twitter. Youtube and Etsy were both a year old and Facebook was two. Hmm…I think I would like to write a book. I thought it might take a year. Ha! Ha! How naive I was! I started with a list of chapters and notes for each, and some ideas about what kind of book I wanted. There were already plenty of beginner sewing books around – I wanted the kind of book I wished I’d had when I was learning to sew but had moved beyond the basics, a “no frills” book that told you how to do stuff. It should have loads of pictures, the more the better, and line drawings rather than photos. I wanted it to be generous, practical, friendly. I wanted information in it that I knew wasn’t available anywhere else, and as well as sewing there had to be some fitting and patternmaking in there too. From the beginning, I was adamant I wasn’t going to self publish. I had bad dreams about the garage filled with boxes of books. If you’re like me, you hear the words “self publish” and think: this person couldn’t find a real publisher. The book must not be very good and probably looks low-quality. But the world of self publishing was to change radically in the next 10 years. And so I chipped away at the book, working title: Liz’s Sewing Book. I worked on it consistently for 2 days a week for 18 months, then after I had children I spent two evenings a week. On reflection maybe this part-time approach worked out well, because I had plenty of thinking time in between writing time. I pondered pocket constructions over the dishes, cropped illustrations while feeding the new baby, and composed topstitching tips as I pegged out the laundry. I worked on the book this way for about 7 years, and at times I wondered if I would ever finish it. Meanwhile we had two children and moved to the country. When it was finished, in 2014, the manuscript was a massive 1051 pages long, but since it was single column, large font and large pictures, I was confident it would compact to less than half that. I knew from experience with Yarn that 6 or 7 pages would be formatted down to 3. (It did – the whole book is 460 pages including front and back matter). I contacted a dozen publishers whose names I had been collecting. Most were craft book publishers, but some were DIY book publishers. Early on I had talks with Palmer/Pletsch, a small publisher in the US but significant in the world of sewing books. They were very interested but said it was too big. Apparently the trend is for smaller books on a niche subject, such as making skirts, sewing with suede, etc. They looked into publishing it as an ebook but heavily illustrated books like mine aren’t very suitable, since you can’t tell what it will be viewed on. So after 3 or 4 months of talks, they said sorry. I don’t mind admitting my eyes leaked; I thought I had it in the bag. After, I had a kind email from an Aussie friend of theirs. She said Don’t worry. Why don’t you self publish? It’ll be a learning curve but it’s the only way you’re going to make any real money from it. So, of my 12 submissions, I received 9 rejections, 1 contract offer and 2 no replies. The rejections didn’t really bother me after the Palmer/Pletsch one. They were the loveliest rejections I have ever read. Some said it was too big, one said they already had books like this (fairly certain they didn’t), one said I lived in the wrong country (they liked to work face-to-face with their authors), for some it was not the right fit for their publishing, and some most preferred me to have a large social media following. No matter; I heard that Harry Potter got 22 rejections, so at that point I was ahead of JK Rowling…although I’m now 400 million books behind her. At the end of these rejection letters I was offered a contract by a big American publisher who had a fashion imprint. They did books of runway collections and designers. They had an educational arm of the fashion imprint and thought my book would be a good fit. They didn’t have anything like it, and they liked that I’d worked in industry and as a teacher. That all sounds really great, doesn’t it? They sent me a contract and it arrived late November/early December. I read it but I didn’t know what to do with it. I can read a contract like anyone, but I don’t have any idea how these things play out. The Australian Literary Guild and SA Writer’s Centre all had contract reading services, but they were having their Christmas parties and closing up until January. I felt a bit like I was drowning! I phoned the legal referral centre and asked for someone who looked at book contracts, and the lady said my local country lawyer should be able to help. The lawyer looked at my contract and said Firstly, congratulations on getting a contract. Secondly, this is a very risky contract. You’re doing all the work and carrying all the risk and not getting much in return. Have you ever thought of self publishing? She highlighted the risky bits, and I managed to re-negotiate half of them, but there were still some sticking points. Then I had a brainwave and googled Australian Authors who had published with this publisher, and discovered a man who had done a book on Art Deco radios from the 30’s and 40’s. He had a world famous collection. He lived in Sydney and was a dentist, so his surgery came up. I phoned his receptionist and he called me back. I asked if he’d had an enjoyable experience publishing with this crowd. He hadn’t. He told me about it, and finished with: Why don’t you self publish? You’ll have to do the same amount of work, so you might as well have all the money and all the control. I had pretty much already decided not to sign the contract, but that was the thing that sealed it. Since then barely a day has gone past when I didn’t thank God I didn’t sign that contract! So now I was self publishing. Self publishing had undergone big changes since I started writing the book. I did some research and decided to use a print on demand and distribution place. Amazon’s Createspace is a good example of this, as is Lulu.com. I used Ingramspark. There’s less hand-holding than with Createspace but a better chance of the book ending up in bookshops. Briefly, you decide on the book’s size, format it on the appropriate template (I’ll say that bit quickly because it took me over a year), change it to a PDF and upload the PDF to their site, along with a PDF of the cover. You set the price and where you want it distributed. The book is printed to order, even if only one copy is ordered, so no warehousing is required. Any changes to the book (say, if you discover a typo) can be uploaded when required (for a fee). The printing can take place in the same country as the customer, so delivery is quicker, cheaper and with less air miles. Books can be dropshipped by the publisher to book reviewers, for author talks or sales. Print on demand is more expensive that traditional print runs, but can be more convenient. So HOW did I get from Hmm, I’d like to write a book, to the finished book? The Dressmaker’s Companion started life as a word document. Apparently you can get book writing software but I only heard about it afterwards. Actually, I confess that The Dressmaker’s Companion was written using Word 2002. Yep, Word 2002. Back in 2006, that was what we had on the computer, and I never upgraded computers until 2015. It was not ideal but easier for me to continue using Word 2002. Some publishing resources I found very helpful were Joel Friedlander’s Book Designer website (“practical advice to help build better books”), the Createspace forums, The Chicago Manual of Style, The Editor’s Blog website, and this one hour Youtube video. Here’s a useful book publishing checklist I wish I’d had. To do the pictures, I first drew them on tracing paper. If you do drawing, tracing paper is your friend! It’s easy to draw step-by-step instructions by tracing off the previous step and making small changes for the next step. From the tracing paper, I used a light box to draw the pictures on paper (Reflex Ultra White printer paper) using a .4 Artline pen. I fitted as many as I could onto one A4 sheet and scanned them into the computer. I used Paint Shop Pro to crop and tidy up each picture. In the beginning I didn’t really know what I was doing—I didn’t know how to use the erase function, so I used liquid paper on my originals! There are at least 3,100 pictures in this book, at a conservative count. To keep track of all the pictures in the book, every picture has a sequential number within its chapter, followed by the number of its master sheet. For example, the picture titled Sleeves 124-14 is the 124th picture in the sleeves chapter, and the original is on master sheet 14. As I said above, it took about a year to put the book in a format for publishing. When I thought it was ready, I sent three copies (just photocopier shop copies) to editors, who all sewed as well. Up until now, no-one had seen it. Showing others my work was really hard and even though I knew they wanted to help me make the book the best it could be, the constructive criticism was hard to read. Fortunately they gave me good feedback as well, and as well as finding typos, style and grammatical mistakes they made good suggestions on sewing technique. While it was being read, the cover of the book got done (read about it here) and I wrote the index. The index took two weeks to write. I always (mistakenly) thought that an index was just an expanded contents page, but it’s more like a reverse-contents: the index writer has to anticipate what word a reader will use to look up what they want. I went through the book and made a list of words, then went through several other sewing books to collect more words, arranged everything alphabetically then edited it. When checking the book’s proof later, it took two solid, boring days to look up everything in the index to check the page numbers. When the manuscripts came back from editing I put the changes in. It was about this time that self publishing nearly broke me. The problem was, I had just spent a year on it and the inside of the book looked lame and I didn’t know what to do to change it. I didn’t have anyone to ask or where to find anyone to ask. My kind brother asked a friend of his for advice, and she said to justify the text, change the footers to headers, and choose my fonts carefully. When the interior file was ready, I uploaded it with the cover file. I’d imagined this would be almost a formality and take only a couple of hours. It didn’t; it took two weeks. The files were rejected due to low resolution of some of the images, thankfully not all 3000+ of them. This was a mystery since all the pictures were the same high resolution. My husband and I tore our hair out trying to find out why. We also had problems with pictures moving in the word document before it was changed to a PDF, a common thing with Word. It nearly broke both of us. In the end I replaced 214 pictures with higher resolution ones and it went through. How much did it cost to self publish? I can say with certainly that it takes a large investment of time! With print on demand the actual money cost can be as little as the price of one book (because you need to buy a proof to check it). I spent a more than that, about $1700. You could easily spend thousands or tens of thousands on book promotion if you wanted to. There were two big items I spent on. One was editing – I didn’t have to do this to actually create a book, but it sure made a better book. I don’t think you could skimp on editing. The other big cost was sending out pre-publication copies to be reviewed. I did this about 10 weeks before the publishing date. I contacted every sewing magazine I could find, and a few other DIY-type mags I thought might be interested. Some never replied but most did. I sent 11 “free” copies to magazines, and two magazines asked for copies as giveaways to readers (= another 9 copies). However, I think this was money well spent. In other costs, I bought an ISBN and barcode package ($85). Some places like Amazon will provide you with an ISBN for free if you don’t provide it, but technically that makes them the publisher. There was a title set-up fee at Ingramspark ($50). I also have this website and I acquired the domain names thedressmakerscompanion.com and elizabethmhaywood.com. I don’t know if self publishing has sold more books or made more money than if I’d signed that publishing contract, but the very best part of self publishing has been having all the control and making it the book I wanted it to be. What’s happened since The Dressmaker’s Companion was published? I started pop-up sewing classes in our town: I rent a space in a church hall and advertise. I’ve just branched out into patternmaking workshops too. If you’re in Adelaide or near the Clare Valley, I’d love to meet you at a class! Click here for times and booking details. 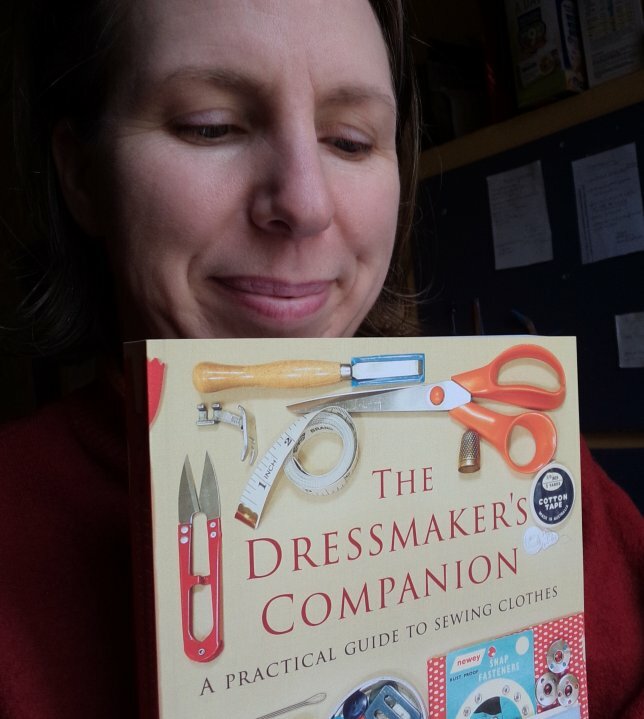 Two months after The Dressmaker’s Companion was published, I looked at it and thought I could do more to make the book easier to read and use. Read about it here. I entered the book in a book award, The Benjamin Franklin Book Awards. There are lots of book awards one can enter, particularly in certain genres such as romance writing, science fiction etc. This was about the only one I thought The Dressmaker’s Companion would be eligible for. Read about the thrilling result here. Thank you for sharing your story. I have heard bits and pieces about your background from time to time, but I have a deeper understanding of your journey now. You are lucky to find what you love to do with early age since many people struggle to discover it. I would imagine that how hard it must have been to put all of your knowledge and experience into a book. But you have completed it despite the challenges. I admire your enthusiasm to pursue your passion. Good luck with selling more of your books and the workshop! I wish you all the best. Thanks for sharing that story. It’s a fantastic example of ‘stickability’. I can’t imagine the blood, sweat and tears that would have gone into producing the book. Our inspirational ideas are one thing but the day, after day, after day, of commitment without any assured success is a whole ‘nother matter! Amazing and congratulations on a such wonderful book. Thanks Julie. I look at books with a whole new appreciation now!